I hope you all had a fabulous Father’s Day weekend. Did you fire up the grill for burgers and barbecue? Or did you visit dad’s favorite restaurant and participate in his favorite activities? My family drove up to Yountville and St. Helena Saturday for brunch and much-enjoyed quality time with my husband, my parents, my sister and brother-in-law. My parents had their first harvest from their vegetable garden and were generous to give me a basketful of goodies when we saw each other: eggplants, cucumbers and bell peppers. After the delightful–but heavy–brunch of chicken and waffles from Bouchon, wine and a sweet treat or two, I was happy to feast on a simple dinner made with homegrown vegetables for dinner that night. If you feel you’ve over-indulged this weekend here’s a summer salad that has a little bit of everything. We can’t seem to get enough spinach lately. They go in our smoothies during the day and in salads at night. 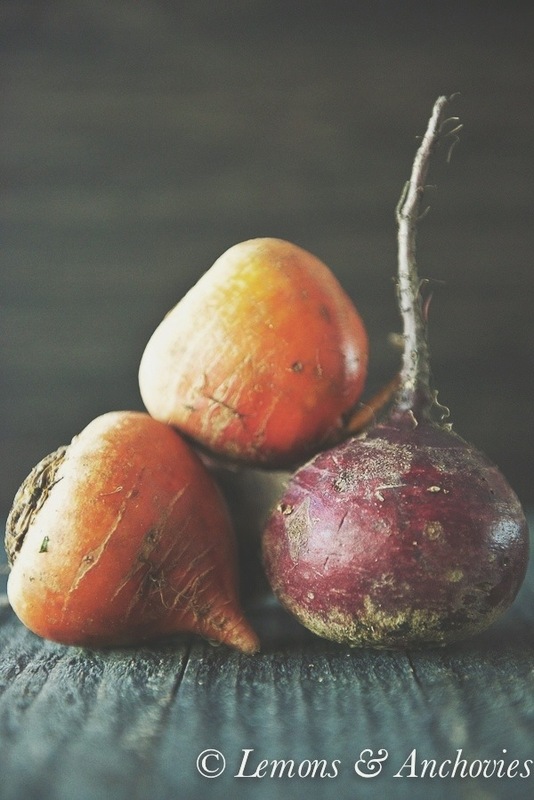 And did you know that beets, though they’re often considered a winter vegetable, are at their best this time of the year? I love them raw, pickled, roasted…any way they’re served, really, but I tend to roast them at home. When I shared a picture of my peeled beets on Instagram before I roasted them, it prompted a comment from someone that she peels her beets after they’ve been roasted. Of course I Googled which way is more common and I was surprised to see that I’ve been doing it differently from everyone else! I didn’t grow up eating home-cooked beets so I just got into the habit of peeling them before roasting them years ago; I never minded the scarlet fingers. Well. Next time I’ll go mainstream and do it the other way. I learned that peeling after preserves their color, too. You learn something new everyday. 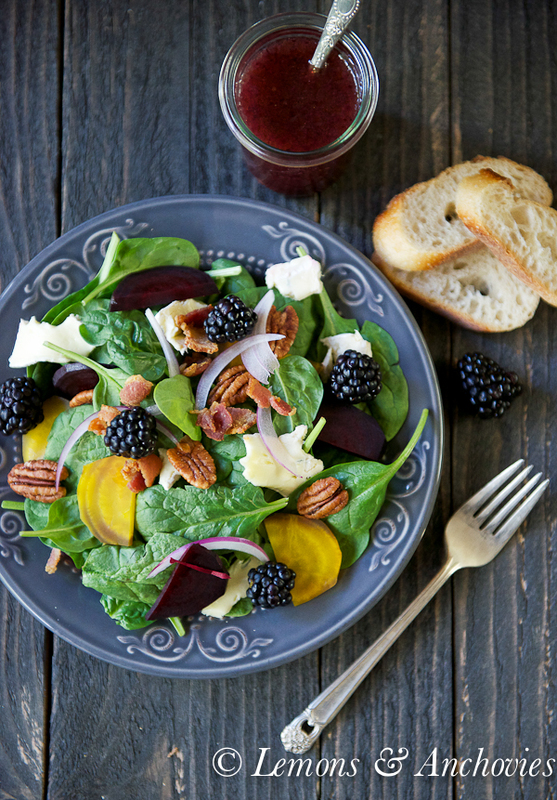 Whichever way you prepare your beets, I think you’ll like this salad as much as I did. I threw in all the goodies in my refrigerator and pantry that I thought would go well together and you can see from the festive colors how flavorful this salad is. 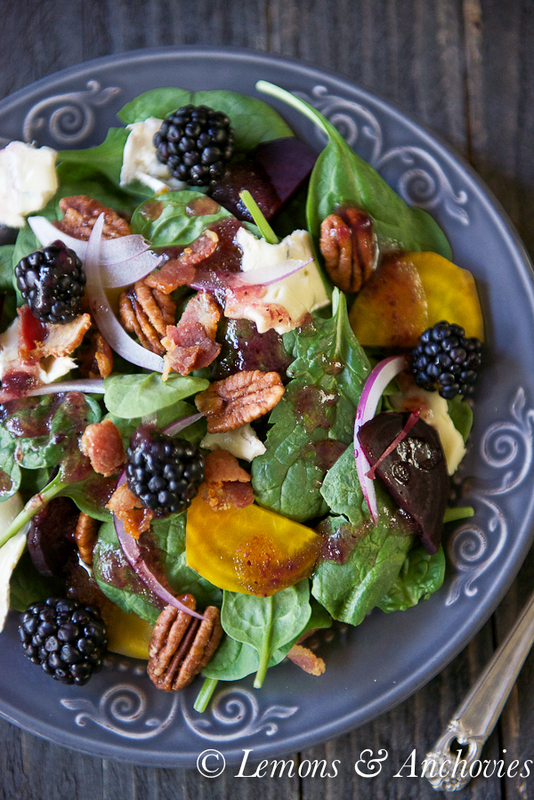 Salads with a spinach base always go well with a berry-based vinaigrette so I used low-sugar raspberry jam and white balsamic vinegar to drizzle over everything for a light, fruity, tangy finish. I still have a few wheels of soft cheese so I added blue cheese (brie would work well, too), candied pecans, blackberries, red onions and bacon, of course. This is a refreshing salad providing multi-layers of flavor–I roasted the beets the night before so they were chilled when I served them with the spinach. This is healthy, summer eating at its best. Loaded with fresh ingredients, this is healthy, summer eating at its best. Roast the beets: Preheat your oven to 375℉. Arrange them on a baking tray and roast for 35-40 minutes (peeled or unpeeled). Cool to room temperature before slicing for the salad. 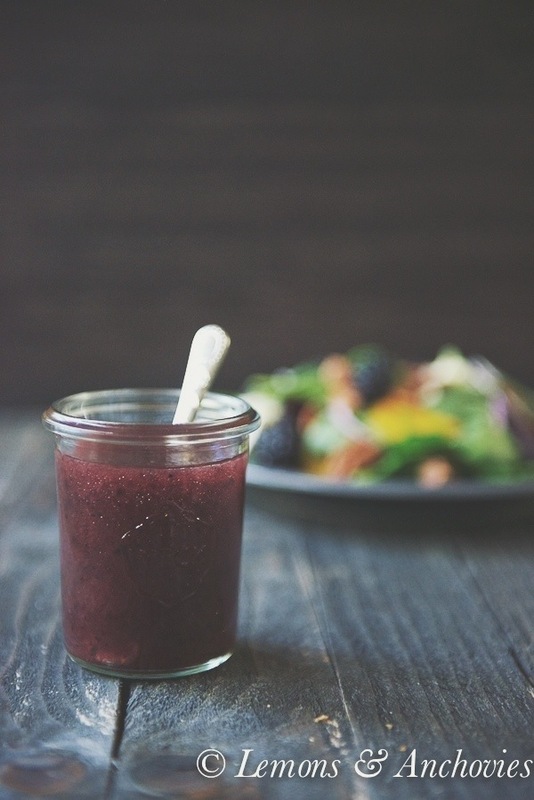 To prepare the vinaigrette: combine all the ingredients from the jam to the vinegar and season with salt and pepper to taste. Add the olive oil and whisk until emulsified. Assemble the salad and drizzle with the vinaigrette before serving. Adjust the vinaigrette ingredients according to your taste. I use a low-sugar jam and white balsamic vinegar is less sweet than the regular variety so this may not be as sweet as you expect. Feel free to add a bit of sugar if that is what you prefer.